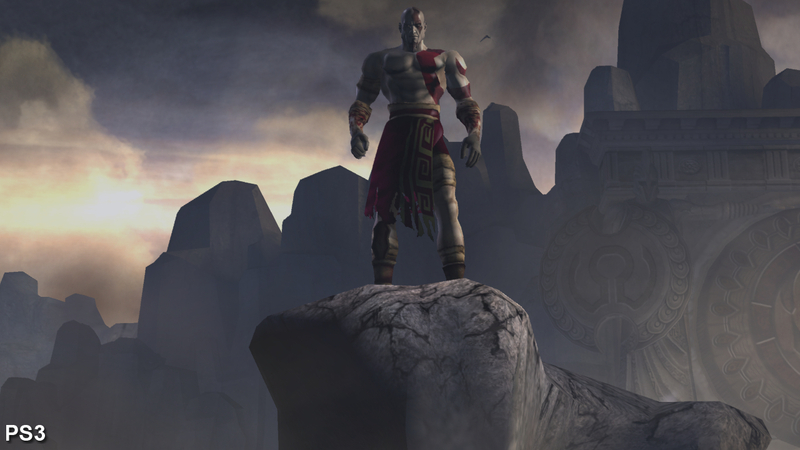 The first two God of War games rank among the most spectacular titles on PS2 - major technical feats from the console's twilight years, both making a worthy jump to the HD era via Bluepoint Games' excellent PS3 remasters. The Vita, meanwhile, has a mixed history with PS2 ports so far, with Metal Gear Solid 2 and 3 taking a visual hit owing to sub-native resolutions, and the Jak and Daxter trilogy running at truly trying levels of performance. 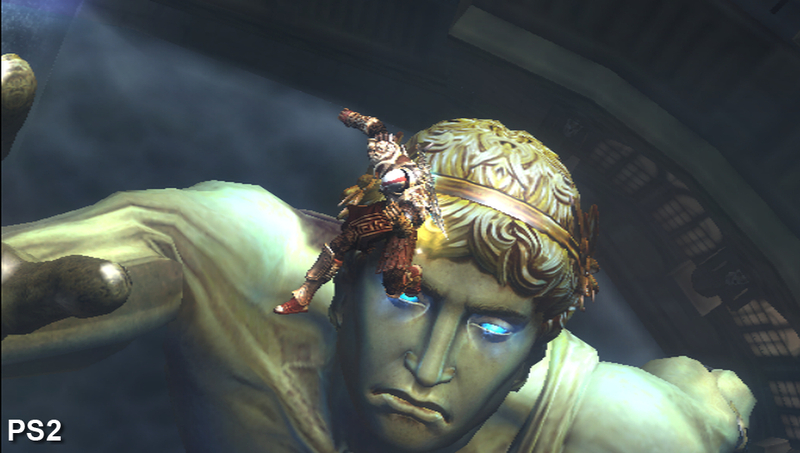 So what's the deal with the God of War Collection on Vita? With Bluepoint otherwise occupied, Sanzaru Games takes point on Vita and it's immediately clear that we're in sub-native waters. 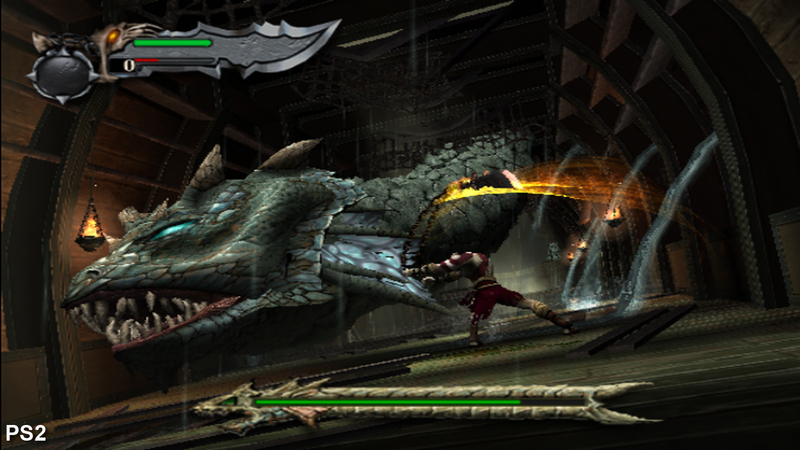 In line with many major releases on the platform, both God of War and its sequel render at 720x408 before upscaling to the full 960x544 dimensions of the display. The result is considerably more muddy and blurred than we'd expect, which isn't helped by the grounded greys and browns of the series' colour palette. Visually, it's worth stating right off the bat that almost everything in terms of textures, geometry and lighting makes the jump from the home console editions - but this chop to image quality can't help but impact our appreciation of the fact. The other major disappointment is in the handling of frequently used pre-rendered cut-scenes, where Sanzaru appears to have significantly cut down the original assets (squeezing both games into a mere 3.3GB download). 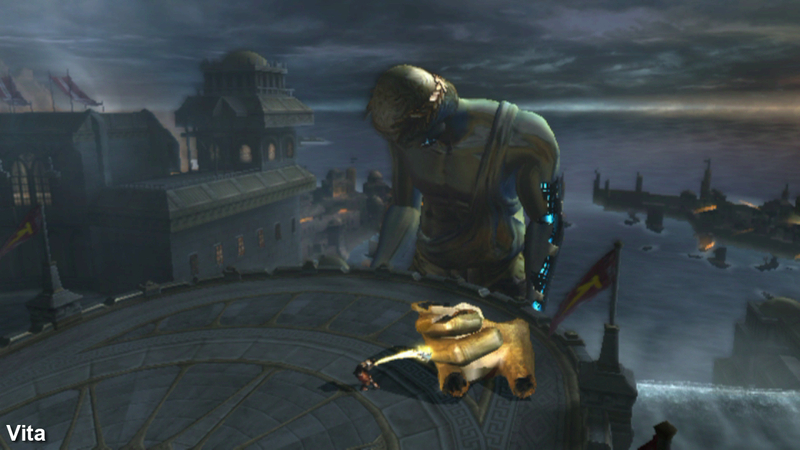 This reduction comes down to heavy compression of both audio and video assets on Vita, resulting in a muffled dialogue, plus obtrusive macro-blocking artefacts during cut-scenes. 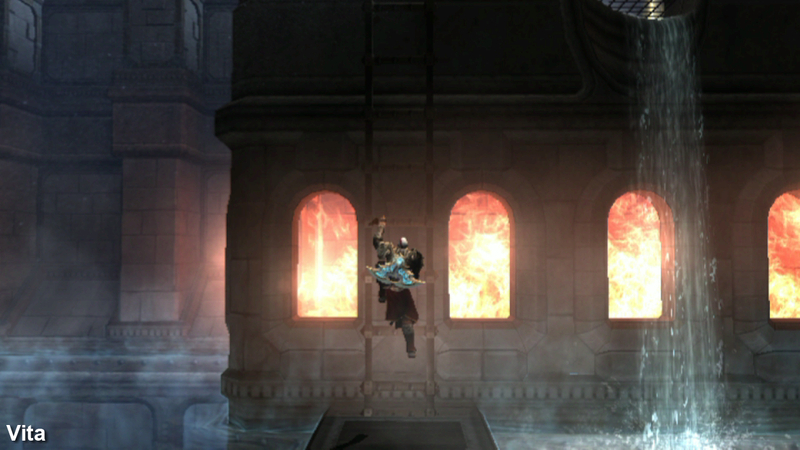 However, more vexing is the use of thick, black borders to frame these cut-scenes. These run at an unstretched 796x506, meaning the story often progresses through a noticeably smaller viewing window than in-engine play. Transitions to and from gameplay are very jarring, making the collection feel lacking in terms of premium finish. In many HD remasters, converting across pre-rendered standard-definition 4:3 assets into HD 16:9 is a significant challenge. 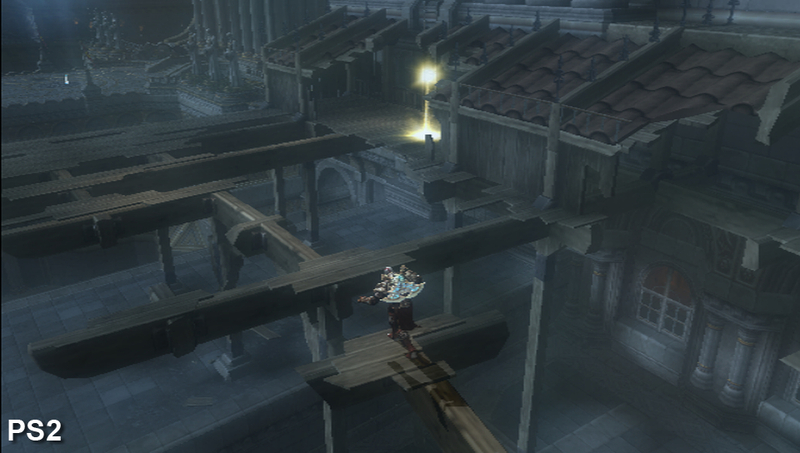 It's probably the weakest element of Bluepoint's PS3 work, but even with the advantage of working with a smaller screen, Sanzaru has really dropped the ball. 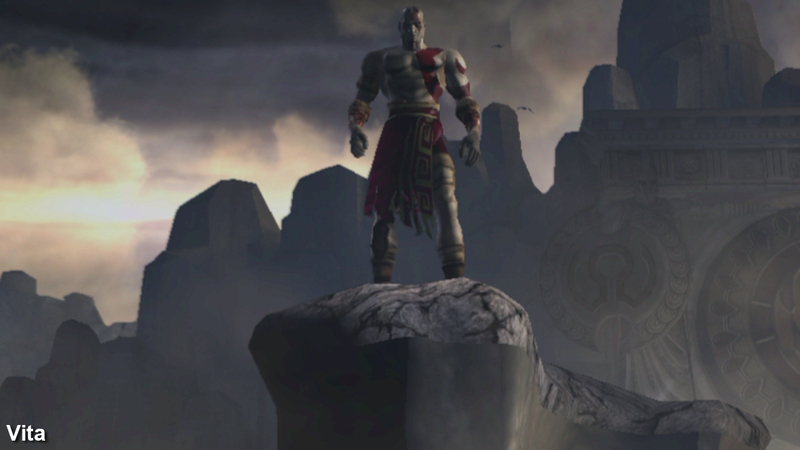 "The original God of War assets have made their way across to Vita virtually unscathed, but the core experience disappoints compared to the PS2 games, let alone the PS3 remasters." 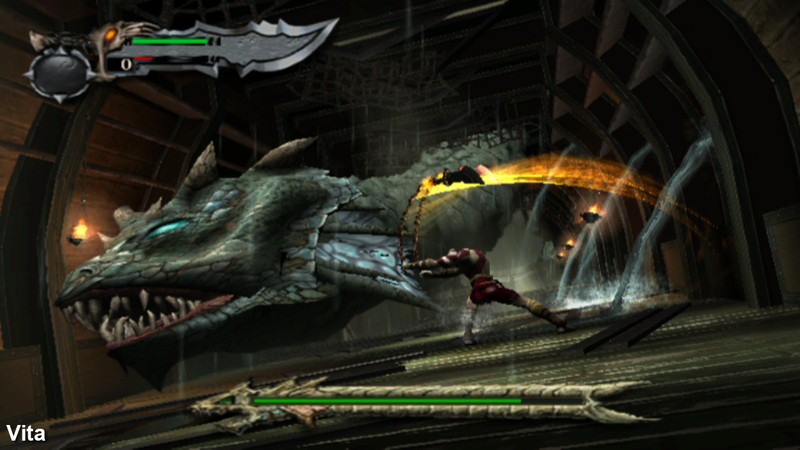 God of War Collection compared on PlayStation 3, PlayStation Vita, and also the PlayStation 2 original (via a full back-compat PS3). Use the full-screen button and 720p resolution for the best viewing experience. But how do the Vita's in-game visuals stack up to other releases? To match all three, we capture the PS2 version via HDMI using a backwards-compatible PS3, and make sure to select the game's progressive scan and widescreen options. The Vita version, meanwhile, defaults to the PS2's "cropped" widescreen setup - unfortunately cutting the top and bottom of the original 4:3 view and stretching the UI elements to suit a 16:9 aspect ratio. This also proved a criticism of the PS3 remaster, and on Vita we see no improvement. Nevertheless, from this setup we're able to construct a three-way comparison video, and a 46-strong God of War Collection comparison gallery. Looking past the image quality hit on Vita, the actual in-game assets are practically a match for the PS2 and PS3 releases. It's uncannily close, right down to the opacity of dynamic character shadows, or the texture-mapping detail on bosses while up close. In the PS3's favour is a heavier use of bloom lighting around windows, though this is a minor tweak in all, and the lighting model is otherwise perfectly translated to Vita. A difference in texture filtering also divides the three, with the sheer absence of it on PS2 causing a distracting visual flicker to distant textures. The Vita clears this up well enough, with smoother brick roads coming at the expense of a blur to flooring past a certain point. Thankfully this is mitigated by the smaller dimensions of the Vita's screen, and is only really noticed when footage is blown up for comparison with PS3. Here we have the Vita version paired up with PS2 and PS3 - both of which we scale to a matching 960x544. The portable edition tones down the bloom lighting used on PS3, as shown towards the rear of the room. Draw distances are an absolute match for home console versions, where it's genuinely impressive how much translates from Bluepoint Games' HD remaster on PS3. 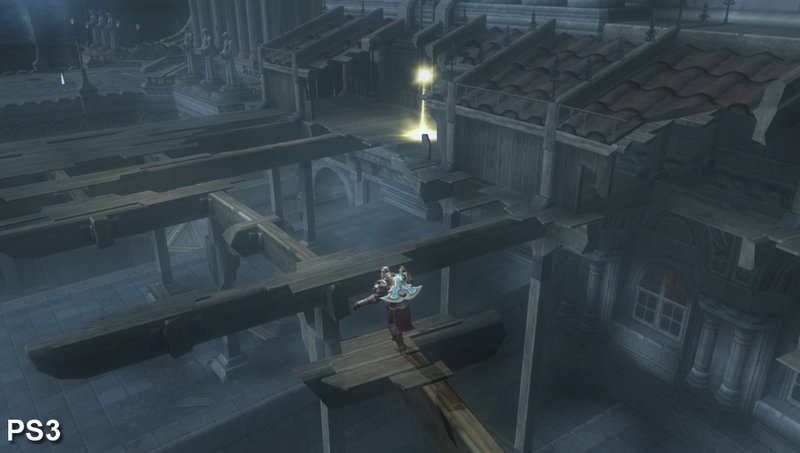 Massive set-pieces hold up on Vita too, and base texture assets go untouched for massive structures and enemies. 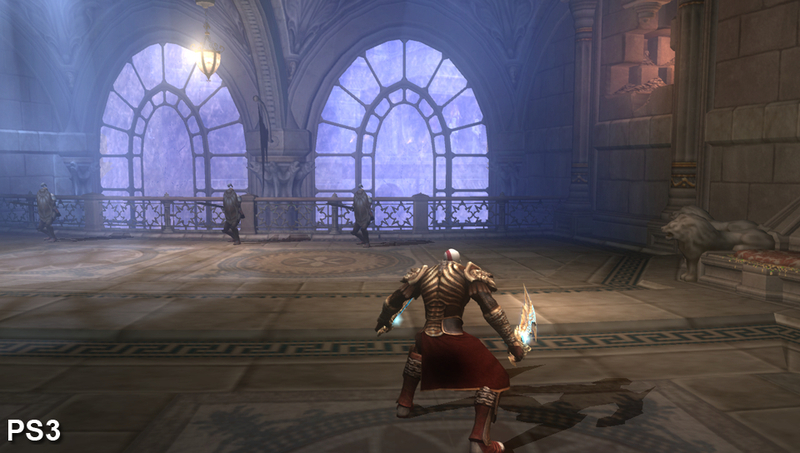 Aliasing is an issue on Vita, as the game is upscaled from an internal rendering resolution of 720x408. However, much improved texture-filtering helps reduce pixel crawl on distant textures seen on PS2. 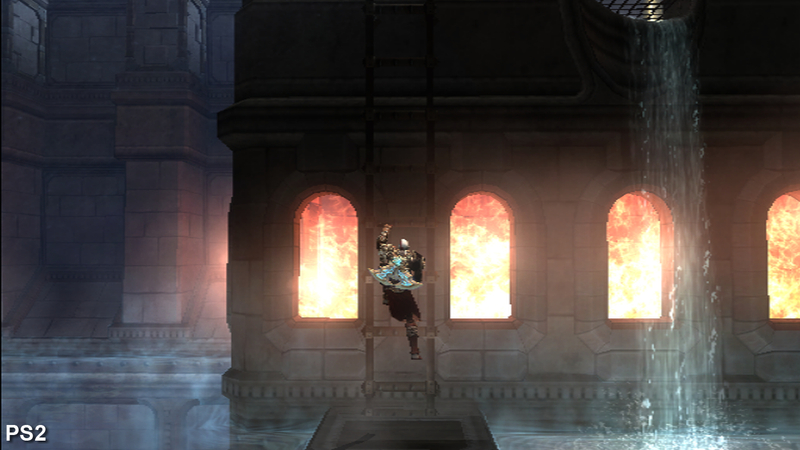 Alpha effects such as fire and water go unchanged from the PS2 edition. 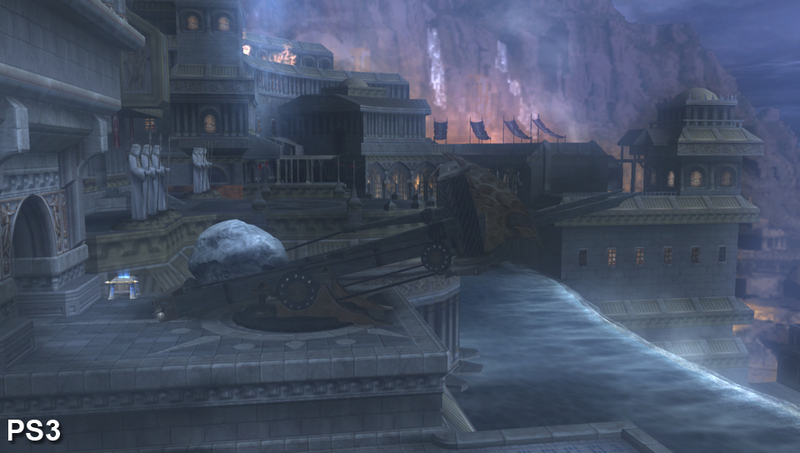 Water shaders are also a match, though underwater sections tax the Vita in the performance stakes. 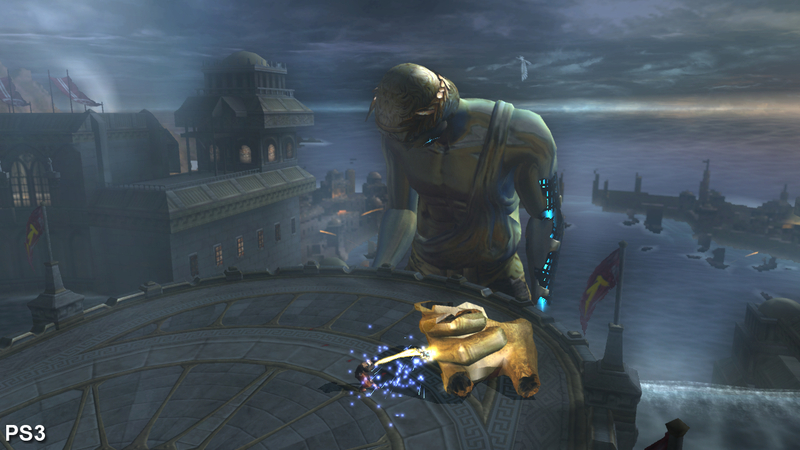 Occasional effects go missing from the Vita version, such as the shower of particles here as Kratos latches onto the golden hand. However, this is an anomaly in the grand scheme of the game. A close-up of Kratos himself. We're in like-for-like territory here, though we do catch odd glitches on Vita like the unresolved texture below his feet. Thankfully this doesn't crop up during play. 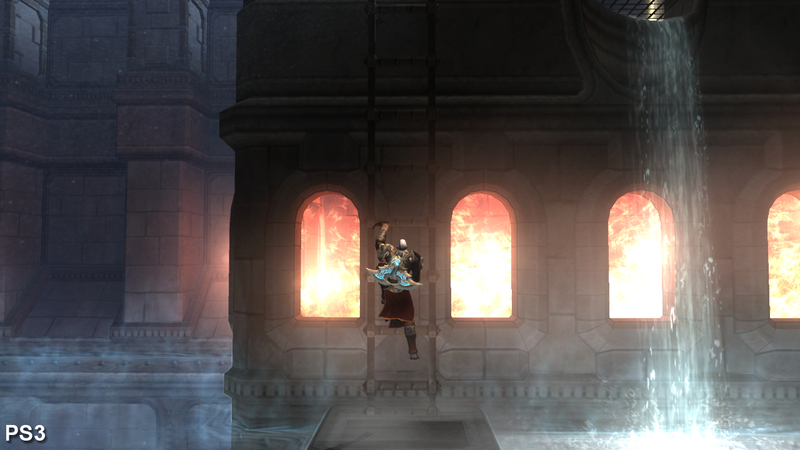 In action against the Hydra in the first God of War, Sanzaru Games takes no shortcuts when translating animations to Vita during quick-time events. Taking on the opening Colossus of Rhodes boss in God of War 2, we see how well set-pieces translate to Vita too. Quick-time events are all adeptly handled in-engine, as you'd expect, with every facet of the game's geometry, animation and effects holding up faithfully to the home console releases. It looks the part for a portable edition, though this determination to achieve visual parity is ultimately paid for in performance. 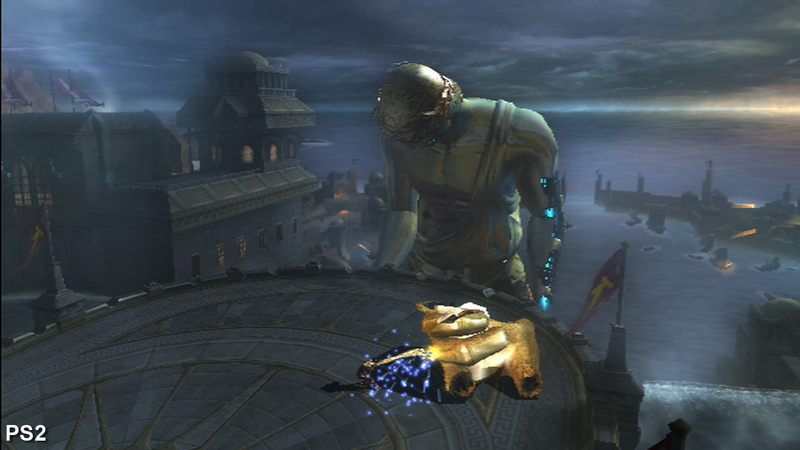 Gone is the 60fps target of the PS2 and PS3 releases, and in its place we have play that shifts between the 20-30fps marks for the game's entirety. It's fully v-synced unlike the PS2 release, but far from operating within the series' usual range - and nowhere close to the 40-60fps range of the original games. 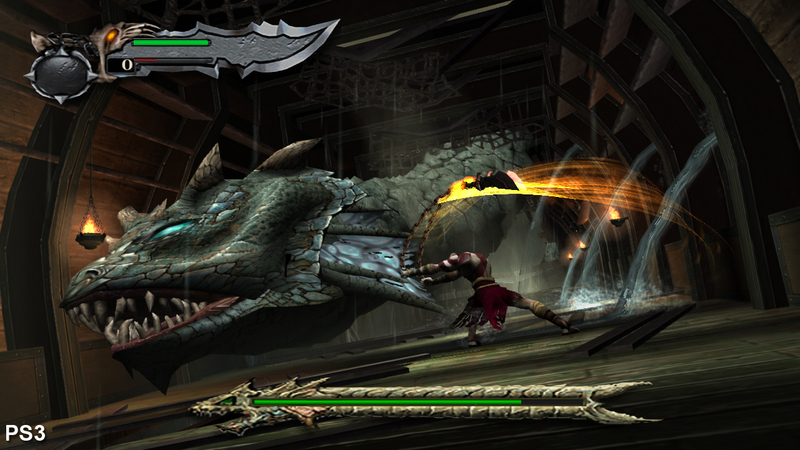 Response to each button press is sluggish as a result, especially where there are long overviews of a stage, or the screen becomes crammed with enemies. As such, this counts as the Vita version's greatest weakness, and with dips to 18fps on record it's impossible to see this as the ideal way to play either game. All of which is a shame, as the actual control setup on Vita is otherwise just a perfect fit. Some token efforts are made to accommodate the Vita's touchscreen controls, with abilities switched by tapping the front panel, and rear-touch used to fill in for the missing R2 and L2 buttons. It's too easy to accidentally trigger a save point this way should fingers just glance the back, but overall it's an effective workaround for opening chests and barging open doors. "Resolution aside, God of War's in-game visuals mostly hold up again the PS3 remaster, but seemingly at the expense of raw playability." Overshadowed by a sluggish 20-30fps range of performance, the Vita version of the first God of War truly pales in comparison to PS2 and PS3 editions with their 60fps targets. Check out the link below for analysis of the second game. Those hoping for an HD remaster along the lines of the excellent PS3 God of War Collection are clearly in for a disappointment. 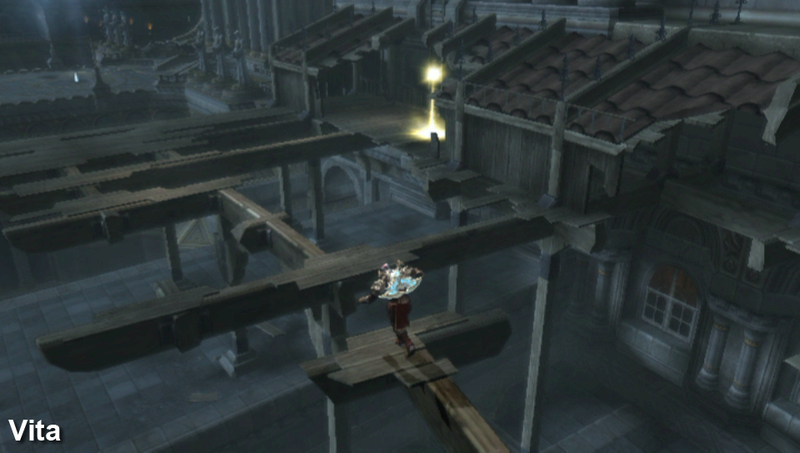 Resolution is increased by just 28 per cent over the originals in this new release, and while there are some image quality improvements, the overall conclusion is that Sony Santa Monica's PlayStation 2 code is easily the better game on the whole. How to complete every main mission and more. Stacked up against Bluepoint Games' PS3 720p60 remasters, the drop-off in quality is alarming (and it's something you can test yourself easily enough - the digital version is Cross-Buy, meaning when you buy the Vita collection, you get the PS3 releases too). 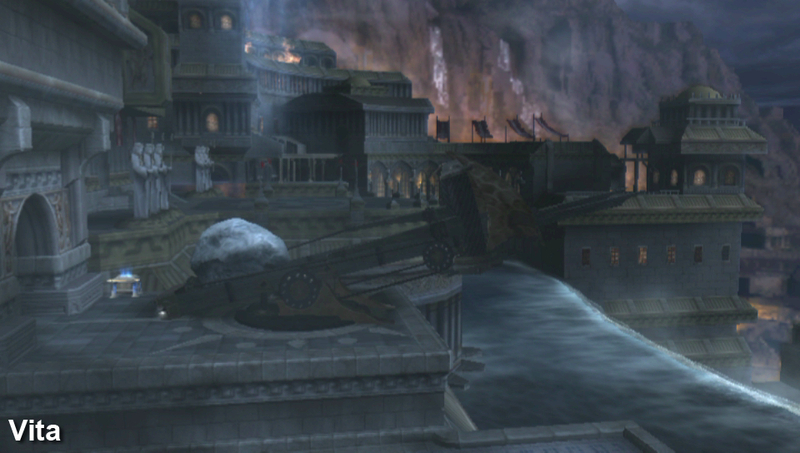 The use of a sub-native resolution means we get a blurred, upscaled presentation during gameplay for both ports. Pre-rendered cut-scenes also take a massive hit in quality compared even to the PS2 game, with heavy video compression and the use of borders all around making it obvious which scenes are rendered in-engine. But the biggest disappointment is in performance. While fully v-synced, we're getting a constant flow of around 20-30fps - sometimes dipping lower - a far cry from the smooth 60fps motion on PS3 with a clear impact on playability. Aside from the odd glitch here and there, the visuals are a match for the other versions, but this has taken priority over the quality of the gameplay. 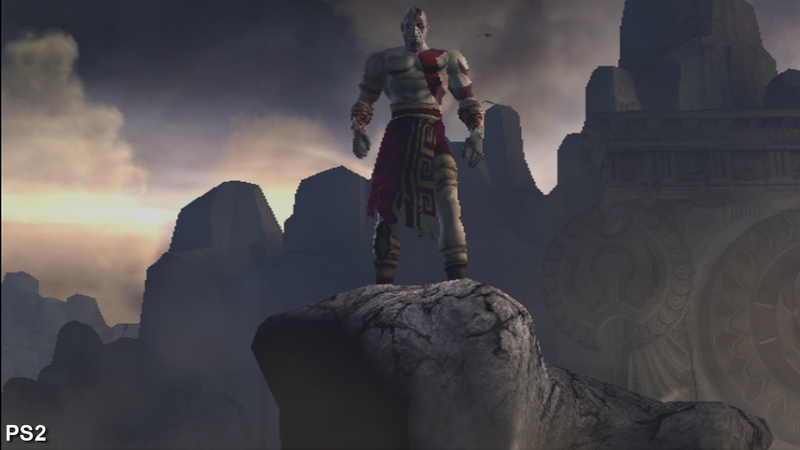 The net result is that the God of War Collection on Vita is perhaps worth a look if you're a die-hard series fan looking for a portable fix, but those same gamers may well be disappointed the most by the lacklustre quality of the conversions.